Researchers have discovered an 8.6-meter long reptile with a massive skull and sharp teeth that lived 244 million years ago, during the Triassic Period. 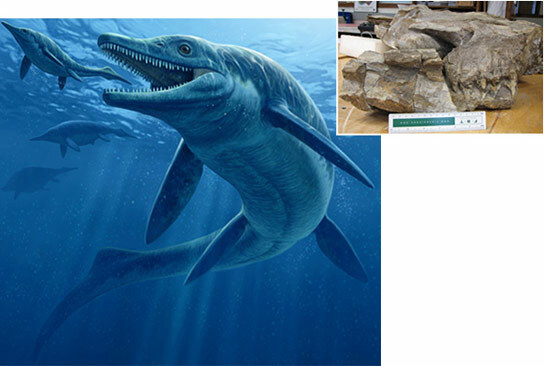 It’s been described as an early ichthyosaur, a four-footed reptile that turned seafarer. The scientists published their findings in the journal Proceedings of the National Academy of Sciences¹. Other ichthyosaurs fed on fish and clams, this one however ate larger prey, including other ichthyosaurs. Thalattoarchon saurophagis lived 4 million years after the first appearance of marine reptiles in the fossil record, and lived just 8 million years after the great Permian-Triassic (P-Tr) extinction, also known as the Great Dying, in which 96% of all marine species and 70% of all terrestrial vertebrate species became extinct. It is the only known mass extinction of insects, with 57% of all families and 83% of all genera becoming extinct. The recovery of the biodiversity on Earth took significantly longer than any other extinction event and it might have taken as long as 10 million years. This was supposed to demonstrate the mercurial evolution of apex predators and the rapid rise of modern marine ecosystems, according to the researchers. This creature also illustrates convergent evolution, as some land-dwelling reptiles evolved into sleek-looking sea creatures much in the same way as some mammals evolved into whales and dolphins. The remains were discovered in 1998 in the remote mountains of central Nevada. A few years later, scientists reviewing field notes learned of the unusual ichthyosaur teeth with two cutting edges. Researchers returned to the site to relocate the fossil and secured a grant from the National Geographic Society to fund an excavation in 2008, revealing the massive skull. Be the first to comment on "28-Foot Ichthyosaur Discovered"